Kerala is a state situated on the southwestern tropical Malabar Coast of India. Tamil Nadu and Karnataka are to its east and northeast boundaries and to its west is the Arabian Sea. Thiruvananthapuram is the capital of this state. 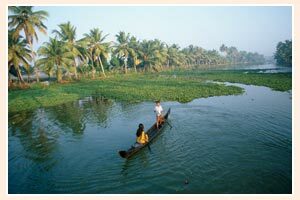 The land of Kerala consists of backwaters and rivers. Kerala is considered to have one of the most advance educational systems and a literacy rate of 100%. A variety of options such as beeches, hill station, wildlife and ayurveda can be enjoyed here. This state is also famous for its specialty in gold and silver brocaded fabrics, iron carvings, buttons, boxes, pottery, ceramic products.